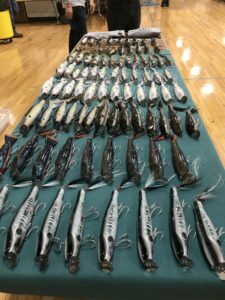 I would like to express gratitude to all of you who came under some very challenging conditions to the Striper Day IV at Ward Melville HS on Sunday. What at one point looked like surefire cancelation of a show, ended up turning into a very enjoyable day, although very wet in the morning. 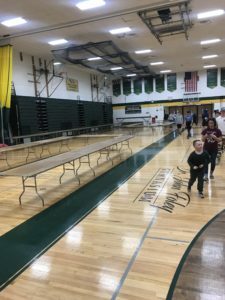 Show went without a major hitch and this is all due to efforts of the members of SJ Show Staff AND Ward Melville HS Fishing Club and faculty. Raffle raised almost 8K which will go towards scholarships for some students that normally would not be a recipients of such awards. In my opinion, now that i got a better fell for the club and its members, I think this is a remarkable organization. And yes, just like any iconic brand or company it is being led by a charismatic and caring teacher, Mr Bob Wilson. My hat is off to him and his staff and all the members on a great organization. We were extremely happy that those who wanted early place on line did not enter the school property till 5 AM as we pleaded with them. I have heard today (actually for the first time) that they had some type of an honorary “list” amongst themselves where they put names in order in which they come. And then honor this “list” when access is granted at 5AM. This is definitely something that is a news to me. Not sure how I feel about it. We had more vendors at Ward Melville than we ever had before and yet we had these beautiful wide isles where you could shop and chat with pleasure. Ward gym is about 15 000 square feet compared to 6000 square feet at Hofstra so we got room and we used all of it. The plug builder lines were kept in middle of the isles not to interfere with other vendors. There was a good mix or vendors from clothing co to plug builders galore to tackle shops, multiple rod co and other retailers specializing in surf fishing. We’ve turned away a lot of interested vendors, although we could have accommodated them with space, they just did not have the right mix of product for a Striper Day type of show. There are definite things we have to improve on if we are invited back next year. Smoking was a bigger issue than I’ve ever thought it would be. We have to do a better job of educating our visitors and vendors that there is ZERO smoking on school grounds EVER. That was a little disappointing. We also need some better signage for seminars including a bigger easel with seminar schedule.Handing out seminar schedule fliers did help a great deal. Thank you to all that contributed to Striper Day IV. The Surfcasters Journal Crew did an awesome job putting on the show. Thanks to the vendors that make shows the draw that they are and a special thanks goes out to the vendors that donated to the raffle. The raffle at this show will directly benefit graduating seniors of the Ward Melville High School Fishing Club and the general population at Ward Melville. Thank You. Thank you for your generosity. Thank you for supporting the kids. Below is a listing of raffles and the winners. As of 1/21, all winners have been notified. If there are any questions, please email the club wmhsfishingclub@gmail.com or you can also contact us via Instagram @patriotsfishing. Names appear as they were written on tickets. Agree with you on the long days– the shows I attend open very early and have very long lines to get in… no one wants to miss out on items that sell out! I don’t like crowds, but deal with it— if I thought I wouldn’t miss anything (giveaway, early raffles, etc) I’d opt to show up later in the day. Regardless, I do like the opportunities to talk with other fishermen and often that’s the reason I stay later in the day.